Excerpt: America is changing, and so is the census. 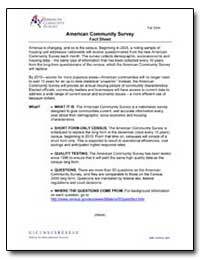 Beginning in 2005, a rolling sample of housing unit addresses nationwide will receive questionnaires from the new American Community Survey each month. The survey collects demographic, socio-economic and housing data ? 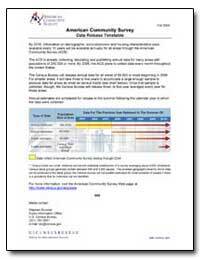 the same type of information that has been collected every 10 years from the long-form questionnaire of the census, which the American Community Survey will replace. By: North Family of Mt. Lebanon, N. Y., Anna White, North Family of Mt. Lebanon (N. Y. By: North Family of Mt. Lebanon (N. Y., Anna White, North Family of Mt. Lebanon, N. Y.